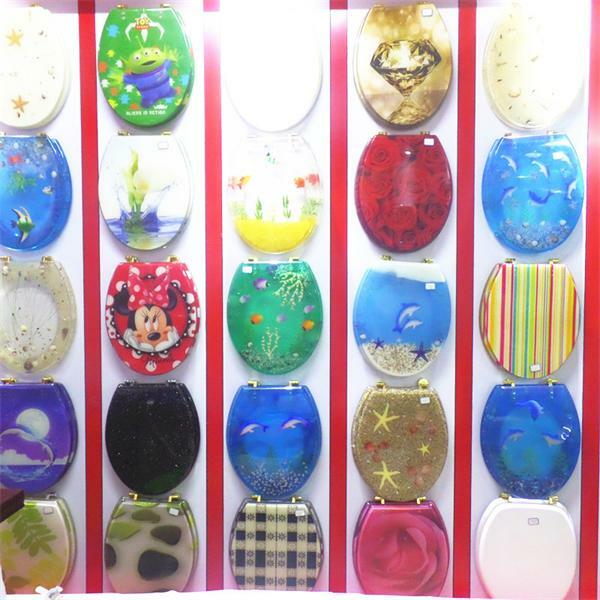 Transparent Resin Toilet Seat Cover: Product material for natural environmental protection resin, and resin inside collocation a variety of physical parts and industrial products accessories, all kinds of resin grouting process using artificial high technology, and in the oven to bake, and polishing burnish glittering and translucent get rid of colorful resin toilet cover plate. Hinge can be in accordance with the requirements of customers: No slow down the plastic hinge; zinc alloy hinge; brass hinge and slow down the plasti; zinc alloy and brass hinges configuration for our customer optional. 1. Durability: hinge used in zinc alloy, stainless steel screw, make sure that never rust. resistance to corrosion, and for a long time resistance. 2. Convenient: cover plate in different size of toilet, lavatory is suitable the cover plate, account for more than 90% of families use the lavatory, the self-contained rod installation and adjustment for different width of lavatory, accessories complete, easy and convenient installation. 3. Comfort: summer cool and refreshing and comfortable, warm and sweet in the winter, let you wash bath more warm and comfortable.